[3.6][Uber Elder down] ELECTRIC SUN. Orb of Storms + Spark. Hybrid. Auto-Selfheal. 2M shaper DPS. Hi guys. I want to share with you my Orb of Storms + Spark build. This is a build focused on Orb of Storms. Spark, as being a Lightning Spell, will trigger OoS additional times when in OoS range. 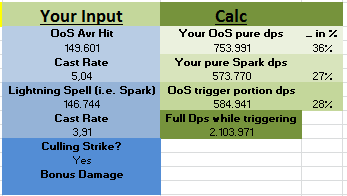 Peak DPS is around 2 million against the Shaper when standing in OoS range and spamming Spark, all buffs up. More details in the background section. As you can see Cast Speed a very important variable here. You gain Cast Speed a lot with this build thanks to Necromancer’s “2% increased Attack and Cast Speed for each corpse consumed Recently”. As enemies hit you, you will trigger CWDT+Spirit Offering and CWDT+Unearth+GMP+LMP. This will recover a lot of ES for you (right now it’s ~1400 ES for me) and additionally give you a minimum of 14% Cast Speed per trigger!! Because Unearth shoots 7 corpses. -> This means each time you eat 528 damage you get a ~1400 ES heal. That’s huge. You will notice, that small hits can’t kill you anymore. In times of huge clutter (Incursion, Betrayal, etc) you will LOVE this. Supporting the whole CWDT-idea, we use Scold’s Bridle. However, Scold’s Bridle won’t let you recharge ES. Therefore I use Fenumu’s Boots and the Watcher’s Eye. For clearing any content I’ve ran 4L-Spark so far with Faster Projectiles (Mana Leech on No-Leech maps; Culling Strike against bosses). Its overpower is similar to KB, which also doesn’t need more than a 4L. To come... In fact, the build starts rolling pretty early thanks to Spark's power. I started the league with it and it’s fun to see it grows in strength. 1) Safe red mapper. Large eHP pool with ES-autoheal (Spirit Offering). 2) Really good clear speed (for incursions, memories, etc). 3) Great for endgame bosses, OoS deals enough damage alone if you want to kite some stuff. Unleash for Spark is also just great for those purposes. 4) no mana problems while mapping. 5) Cheap to start. Expensive to master (for me this is a PRO – you have an aim). 1) You will feel forced to trigger OoS to have full DPS potential. This results in dangerous positioning. 4) While bossing your mana regen might be a bit slow for perma-spark. But since you kite and dodge stuff in hard fights the regen should be enough. T16 Maze of the Minotaur <- the mods take a lot of damage. it should be ~66% more. You will probably need one Abyss jewel with a bit of Resists when you don't have enough on gear. Fenumu’s ES gain will commonly be enough but I highly recommend picking up this unique jewel also. Shakaari for poison immunity, because why not? Arakaali because we fear Chaos damage in general. No special routes here. I went left first and then right. If you have Discipline Watcher’s Eye use Scold’s Bridle. Otherwise use a nice Level 20 Innervate Rare helmet. That will make you very powerful while mapping. Rare Vaal Regalia. The new veiled mod scales with your max life% and ES%. A chest like this is same as a 700 ES Regalia, which is much more expensive. The target is to acquire a 700+ ES chest, tho. You can sink a lot of money here. I’ve bought this weapon for 10c and bought a service to craft the Trigger-mod on it. The trigger mod is absolutely crucial, because it will serve you with Power&Frenzy Charges and use Wave of Conviction to demolish enemie’s resists. Our bread and butter for our hybrid/auto-healing concept. There is no other option. Fenumu’s is really great because of the ES gain. However, a good pair of Doryani’s are nice, too. You want rare rings to cap your resists, get STR/Life/ES on them! They’re really cheap. You need one ring with an open suffix to be able to craft Aspect of the Spider on it. Astramentis is great for a hybrid build like this. It gives you a lot of stats for your gloves. Stygian Vise is great but not necessary. If you have some currency to spare go grab one. I would recommend a lot of resists here! You should rather get a 110%+ res heavy belt instead of a Stygian Wise - to be more flexible with your rings! Vessel of Vinktar Added Lightning Dmg is just great and so underrated. In the end we want the new flask “Bottled Faith”, but that’s very expensive (exchange Wise Oak for that). Why not Tempest Shield to trigger OoS? I've been playing with Tempest Shield for a while. The clear speed was really not comparable to spark - it was horrific. The paper DPS for bosses is higher, but being forced to get close to bosses is a huge downside. I rather like safe-play from distance and from time to time get into the melee distance. Since Tempest Shield doesn't do any DPS contribution besides triggering OoS, it's not SO much better as one could expect. Spark, with our Skill Duration nodes, is really strong since it hits an enemy at least twice with the new re-arming duration of 0,66 seconds. I speced into it. It's pretty fun so far. Gonna take it bossing. However: You said no mana problems. I seem to be having issues currently with mana when casting spark repeatedly. Do you know why? Or am I just playing it wrong? Regarding mana, do you have some support gems linked to your auras/herald? Yes, when casting spark very often you are not regenerating enough to permanently cast it. But until now, even when fighting Cortex and such, I barely had those situation where I perma-cast... as you usually dodge stuff and while kiting you regen enough. I played Spark/Elementalist since league start and wasnt satisfied with the survivabilty during Bossfights. You had to stand still and perma Spark him in the Face while taking shitload of DMG. Now since i respecced to your Necro OoS Sparker all the content is a peace of cake. Much more Survivabilty while circling around the Boss watching him getting melted by OoS. Good job. Keep on doing Guides. Gotcha. That's fair. Nah, I have the same amount of mana reservation as you. About 200 mana left over. But I'll try UElder today and let you know how it goes. Yea sure. If you like just record the fight and share us a youtube link :-) Will attach it to the guide. The mods really took a lot of my damage. however, the fight with minotaur is nice to see how less damage I suffer from the fight. Any reason why you don't use spark threshold jewels? First because reduced duration is a no-go for spark. re-arming time is 0,66 seconds. right now our spark has 2,8 second duration. so spark can theoretically hit the enemy 4 times. with spark threshold jewel it's 3 times. so -25% damage for spark. second, the projectiles are so fast, you dont need area casting. Finally managed to kill Uber Elder. The build is not optimal for this encounter tho. The build lacks burst DPS. However, it was fun to see what's possible :) Ofc, my gear is still not ideal. with some 100ks more DPS it would be easier.